During the week of June 19, 2017 a vessel transiting the northeast portion of the Black Sea reported multiple instances of GPS interference. Approximately 20 other vessels in the same area appeared to experience similar interference. The master of the vessel knew to contact the U.S. Coast Guard Navigation Center (NAVCEN) to report GPS disruptions. The steps he took to maintain situational awareness and safe navigation are good examples of techniques mariners can use during such an event, and NAVCEN would like to share them with the maritime community. On paper charts, the master used radars to mark the bearing and distance of any relevant areas of the coastline. 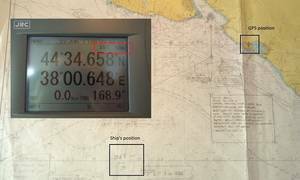 He switched his Electronic Chart Display (ECDIS) to Dead Reckoning (DR) mode and used the radar overlay function to confirm his position. Because the vessel was waiting and drifting in an Off Port Limit (OPL) call status, the master regularly entered an offset on the ECDIS to match the radar overlay. As a verification method, he then repeatedly compared his paper charts to ECDIS. The area where he was drifting was too deep to use the assistance of his Echo Sounder for further verification, but he noted that it could have been used in suitable depths. When back underway to the pilot station after drifting/OPL, he used the Parallel Indexing (PI) method on both of his radars. The master noted that the use of the PI tool when approaching the coast or channeling is an efficient and accurate way to confirm position, drifting and determine turning waypoints. The vessel he was operating did not have any other satellite positioning systems, but the master reported that the above methods worked well during the incident. Situational awareness, to include verified position and velocity, is vital for safe and effective commercial operations. Although GPS has proven to be extremely reliable, NAVCEN stresses that it's important to ensure alternative methods and systems are available, understood and used. Since few mariners experience a sustained loss of GPS, it's easy to become complacent. Therefore, manual checks and other back-up systems must be exercised on a regular basis. Some interference sources include multipath propagation, atmospheric conditions and GNSS segment errors (e.g. erroneous upload data). Immediately report GPS disruptions or anomalies to the NAVCEN through NAVCEN's website or via phone at 703-313-5900, 24 hours a day. Take note of critical information such as the actual location (latitude/longitude), date/time, and the duration of the outage or disruption. When possible, provide photos or screen shots of equipment failures during a disruption to assist analysts identify a potential cause. NAVCEN will work with multiple U.S. government agencies in an attempt to identify the problem and correlate with any other GPS incidents in the same general geographic location. There are a wide range of options that exist for fixing a position without GPS or other GNSS. Additional information on GPS topics is available at www.gps.gov/spectrum.